From L-R: "Frida Kahlo: Art, Garden, Life" courtesy of the New York Botanical Garden and photographer Robert Benson; "Living Pyramid" courtesy of American Academy Rome/Twitter; "COSMO" courtesy of Andrés Jaque/Office for Political Innovation; "Constellation" courtesy of Todd Heisler/The New York Times/Redux; "Unframed –- Ellis Island" courtesy of JR Photo Gallery; Coney Island Art Walls courtesy of Brooklyn Street Art/Photographer Jaime Rojo. It's finally July, which, in the Northern hemisphere, means summer has descended upon us all. While many New Yorkers bide their time in the warmer months with rooftop barbecues, outdoor brunching and picnics in the park -- all perfectly respectable options -- we're here with a list of events that doesn't revolve around imbibing or consuming food in the sunshine. Yes, we've compiled a roundup of the public art events and various installations taking over New York City and its surrounding areas. If you're looking to envelop yourself less with mimosas and gingham blankets and more with sculptural feats and street art extravaganzas, consider this is your go-to seasonal bucket list. Rendering of Andrés Jaque/Office for Political Innovation’s COSMO, winning design of the 2015 Young Architects Program. The Museum of Modern Art and MoMAPS1. Image courtesy of Andrés Jaque/Office for Political Innovation. 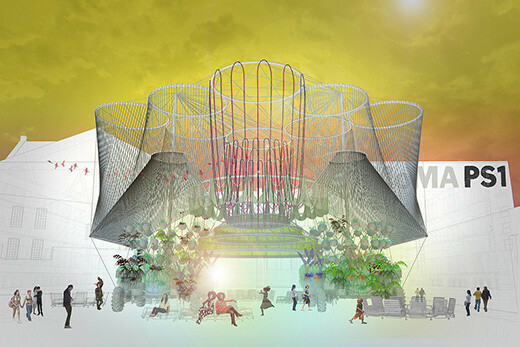 What: Andrés Jaque is the winner of the annual Young Architects Program (YAP) at MoMA PS1, a competition that challenges emerging architects to design a piece that addresses environmental issues like sustainability and recycling. This year, Jaque designed "COSMO," an assemblage of irrigation components capable of filtering and purifying 3,000 gallons of water in an architectural site both aesthetically and functionally pleasing. When: June 23 - Sept. 7, 2015 Where: MoMA PS1 Why: You can check out "COSMO" during the 2015 Warm Up music series in the museum's outdoor courtyard. Two birds with one stone, right? Image courtesy of FAILE & BÄST. What: FAILE, aka Brooklyn-based art collaborators Patrick McNeil and Patrick Miller, are building the "Deluxx Fluxx Arcade" in the Brooklyn Museum this summer, recreating their punk rock and graffiti-inspired arcade filled with video games, pinball machines and foosball tables. Yes, you can play the games. When: July 10 - Oct. 4, 2015 Where: The Brooklyn Museum Why: The "FAILE: Savage/Sacred Young Minds" exhibition also includes "Temple," a life-size structure made of iron and ceramic that incorporates prayer wheels and pop culture imagery as "a reaction against commercial development and consumer greed." Double the fun. 3. "Frida Kahlo: Art, Garden, Life"
Image courtesy of the New York Botanical Garden and photographer Robert Benson. What: The New York Botanical garden reimagines Frida Kahlo's garden in Mexico City, including cacti and succulents, roses, dahlias, prickly pears, orange trees, sunflowers and ivy. When: May 16 - Nov. 1, 2015 Where: The New York Botanical Garden Why: The NYBG has an entire calendar filled with Frida-inspired programming -- Cooking with Frida, the Octavio Paz Poetry Walk, the ¡Cámara, Acción! Mexican Film Series. And it all takes place in the expansive green landscapes of the Bronx. What: A 30-foot pyramid made of soil and planted grasses, situated on the East River waterfront in Long Island City, Queens, and meant to prompt discussion of "environmental priorities and social hierarchies." When: May 17 - Aug. 30, 2015 Where: Socrates Sculpture Park Why: This is Agnes Denes' first public artwork in over 30 years. Get thee to Queens. What: 50 miles north of New York City, artist Melissa McGill has created a light-based public art project that appears like a constellation of stars on the perimeter of the Bannerman castle ruins. When: June 28, 2015 - Summer 2017 Where: North Hudson Highlands Why: Need an excuse to head to the Hudson River? "'Constellation' references a belief of the Lenape, the indigenous/Native Americans of the area, of Opi Temakan, the 'White Road' or 'Milky Way' connecting our world with the next." Image courtesy of JR Photo Gallery. What: French artist JR was invited to work on the abandoned hospital complex at Ellis Island last year. He transformed the former gateway to the United States into a visual archive of the immigrants who passed through the island, pasting portraits of immigrants and doctors onto the empty brick walls, lockers, window panes, stairwells and washrooms. When: Now! The work will remain up “until it decides to disappear." Where: Ellis Island Why: Take a 90-minute hard-hat tour of the unrestored Ellis Island hospital complex, see some art too. Image courtesy of Brooklyn Street Art/Photographer Jaime Rojo. What: Deitch Projects and Thor Equities helped bring together a number of famous street artists (Maya Hayuk, Shepard Fairey, Ben Eine, Ron English, Kashink, so many more), all of whom were commissioned to paint 30 walls located smack dab in the middle of Coney Island. When: Now! (There is no official closing date.) Where: Coney Island Why: Street art + hotdogs = summer bliss. What: Italian artist Tatiana Trouve discovered that there are 212 marked pathways in Central Park. Her research led her to create a unique piece of public art -- a collection of 212 oversized spools placed on three large-scale storage racks. Each of these spools is equipped with rope equivalent in length to one of the Central Park pathways, labeled to identify its location in the park so that viewers can explore new ways of walking Manhattan's outdoor gem. When: March 3 - Aug. 30, 2015 Where: Central Park Why: This is for the self-professed Central Park lovers who are looking for a new treasure map. Courtesy of König Galerie, Berlin; 303 Gallery, New York; and Galleri Nicolai Wallner, Copenhagen Photo: James Ewing. What: This three-part exhibition includes "Appearing Rooms," an installation made from walls of water that create disappearing and reappearing rooms; "Mirror Labyrinth NY," a series of stainless steel planks meant to mimic the Manhattan skyline; and "Modified Social Benches," 16 bright red benches scattered along Brooklyn's waterfront that you just can't miss. When: May 17, 2015 - Apr. 17, 2016 Where: Brooklyn Bridge Park Why: It's nearly impossible to ignore a dictate that actually encourages us to put our hands on art. 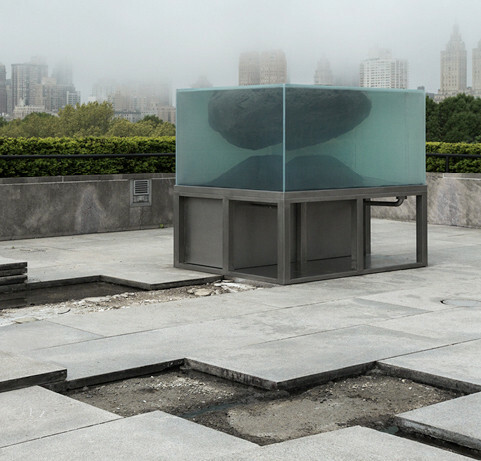 What: As part of the Metropolitan Museum of Art's annual Roof Garden show, French Conceptualist Pierre Huyghe has arranged a number of paving stones, a schist boulder, and fish tank filled with, among other things, lava rock, lampreys and tadpole shrimp atop the iconic Manhattan destination. When: May 12 - Nov. 1, 2015 Where: The Metropolitan Museum of Art Why: How often do you get to meditate amongst a bizarre rock garden built on top of the Met? Images courtesy the artist; Cheim & Read, New York; and Locks Gallery, Philadelphia. What: Sculptor Lynda Benglis installed a series of works titled "Water Sources" across the property of the 500-acre sculpture park Storm King. When: Now until November 8, 2015 Where: Storm King Art Center Why: Do you really need another excuse to go to Storm King? Image courtesy of Olafur Eliasson Studio. What: One word: Legos. Danish-Icelandic artist Olafur Eliasson is tempting New Yorkers with thousands of white Lego bricks and the chance to build their own mini-urban utopias atop the High Line in Chelsea. When: May 29 - Sept. 30, 2015 Where: High Line Why: If you've always dreamed of playing with a monochromatic Lego set whilst standing atop a train-line-turned-green-space and contemplating the future of architecture, head to the High Line now.